When you think of Turner Classic Movies (TCM) you might not think innovation or even entertainment depending on your taste… or age. I get it, b&w and silent movies aren’t for everyone. They aren’t super mainstream, and generally don’t compare to a Star Wars type flick with their cult-like following. Well, bear with me as I convince you otherwise. 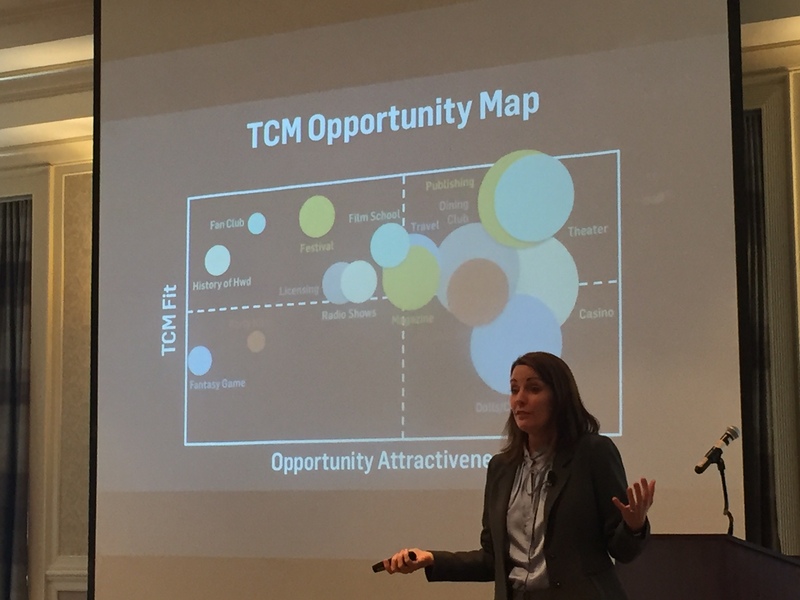 I recently heard from Jennifer Dorian (@JRDorian), a General Manager at TCM, who completely changed my perspective as she showed me how her team has built a loyal and highly engaged community. Capitalizing on fan passion is a science, as is matching that passion to brand extensions. From TCM-branded cruises to festivals and wine clubs, they’re catering to their fans using insights and data to build seemingly risky extensions as well as optimizing the portfolio of investments. TCM has maintained a strong brand for over 21 years, never losing focus of their fans by showcasing uncut video, commercial free, with engaging themes and background content. 19 Moments You Knew You Were Addicted to TCM: You know you’re staying relevant when Buzzfeed publishes a listicle. Brand perception is high among fans, as TCM is valued in the Top 5 stations that fans consistently want to keep. Fans are quick to provide feedback and work with TCM to perfect the product. Even if you don’t regularly tune into TCM, you’ve probably heard of the channel or at least flipped over while aimlessly browsing for shows. Well, it’s no mystery why the channel is still alive and kicking thanks to the marketing team driving new ideas and extensions internally at Turner. With a strong brand promise for 21+ years, TCM has never lost focus of their fans by continuing to bring uncut video, commercial free, with curated themes and exciting background conversations through their program hosts. In today’s day and age, this is super impressive. Jennifer continuously expressed her gratitude for being a part of the TCM team. These self-acclaimed movie nerds genuinely care about the TCM mission and approach their sincerity and optimism. For them, it’s the opportunity of a lifetime. 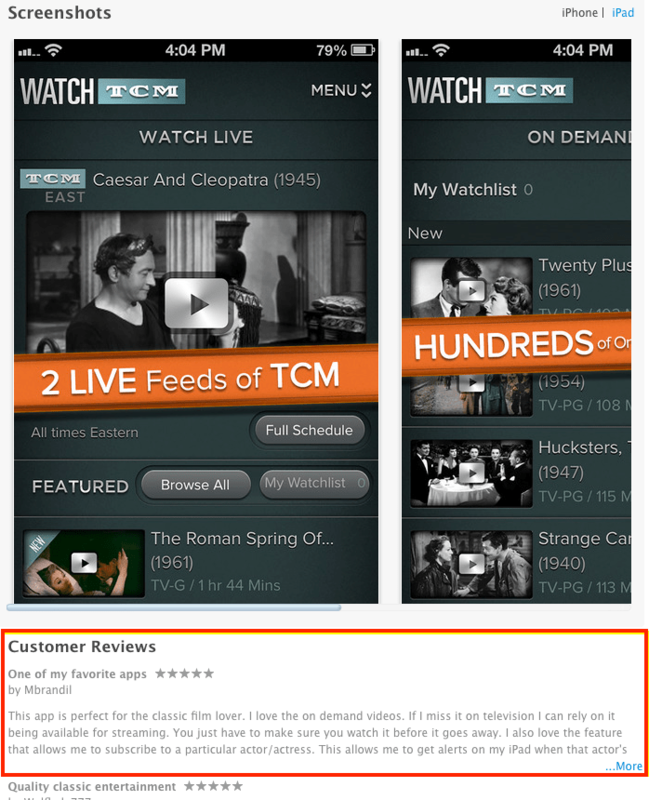 They’ve innovated the brand to best-in-class status beginning with an official TCM App, which receives overwhelmingly positive reviews and thousands of downloads (see image below). Integrations in the app as simple as their Now Playing Guide are receiving big praise when it’s really just a simple schedule reformatted and optimized for a quick, mobile experience. TCM houses over 17,000 classic films, the largest collection of old movies. Well, “how do you define a classic?” you might ask. Basically, anything from between 1890-2010 with varying characteristics based on topic, director, style, etc. Let’s leave categorization to the experts. Now that you’ve found a cruise you never knew you wanted to go on, let’s move on. Next up, TCM partnered with Fathom Entertainment to do movie screenings of ~75-year-old movies in modern theaters. With flexibility in the P&L to try new things, this resulted in a win/win/win, earning money for TCM, the venues and studios alike. We wrapped up with Jennifer’s own takeaways and some additional talking points not discussed above. Hope this changes your perspective of TCM! If not, tune in and see what the experience is like. Keep up the good work, Jennifer & Co.